As a landscaper, I’d agree with most of the definition but dispute whether or not a deck usually connected to a building. I’d also add that a deck as I know it, tends to be built from timber – or a timber-like substance. Here are some of Holland Landscapes’ recently built decks. 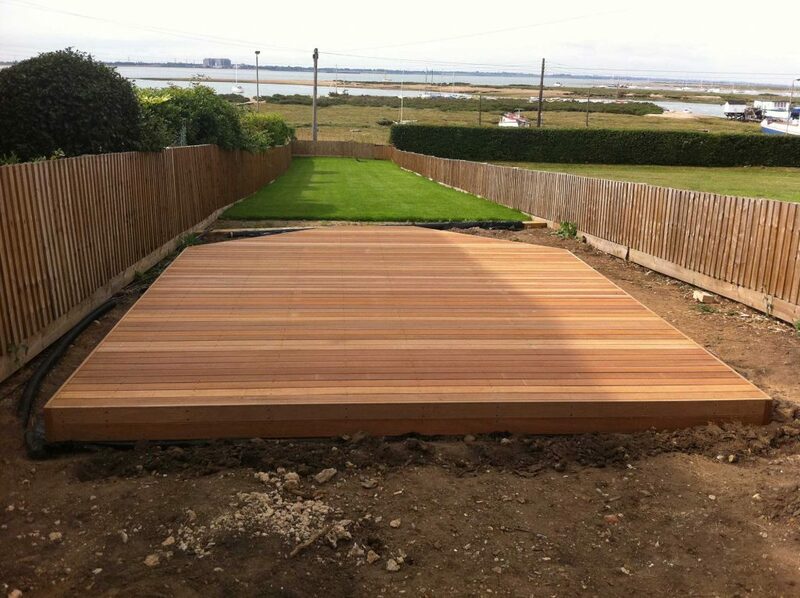 A partially completed deck on Mersea Island. I like how the shape of the deck leads the eye out towards the sea view. Decking has a nautical feel to it which lends itself perfectly to coastal gardens like this one. It seems I’m not the only one who likes natural wood decking. 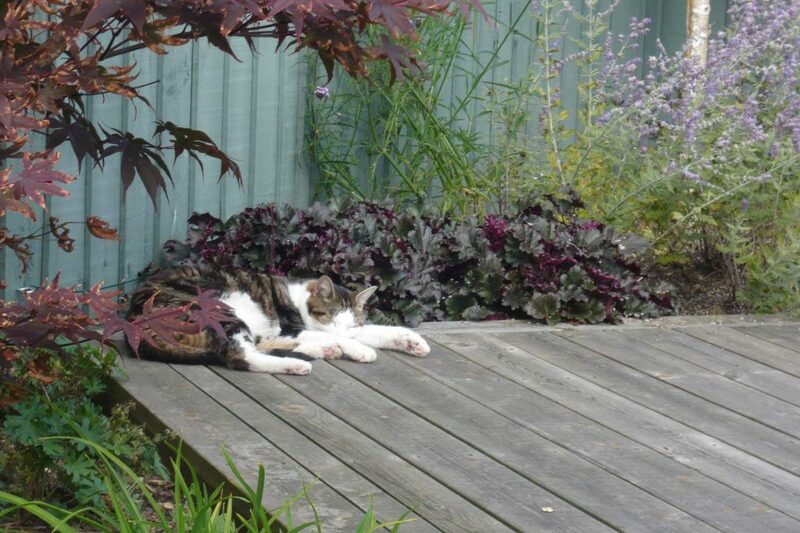 Cats always know the best places to relax and this one has obviously discovered how timber is a comfortable temperature to sit on virtually all year round. How stylish is this? A traditional building material (timber) incorporated into contemporary landscape design. Love it! Why does decking remain such a popular landscaping feature? My Dad started Holland Landscapes 30 years ago and in that time he’s seen lots of gardening trends come and go. In fact, he says if he looks back further than that he can remember the 1970’s when the standard design for a front garden was a rectangular lawn framed by narrow borders filled with red white and blue bedding plants. Since then we’ve seen rock gardens, gardens based on conifers and heathers, gravel gardens, water gardens, crazy paving, Japanese style gardens and more. Today, most, if not all of the gardens we work on include some sort of hard landscaping and decking is just as popular as it was 20 years ago. Why? Personally I think it’s because decking has such a traditional feel about it. It’s not a traditional garden feature – As far as I know, Capability Brown didn’t build any wooden decks, neither did Gertrude Jeckell but a wooden floor, whether it’s indoors or outdoors has a wonderful retro feel about it. Plus it’s versatile. 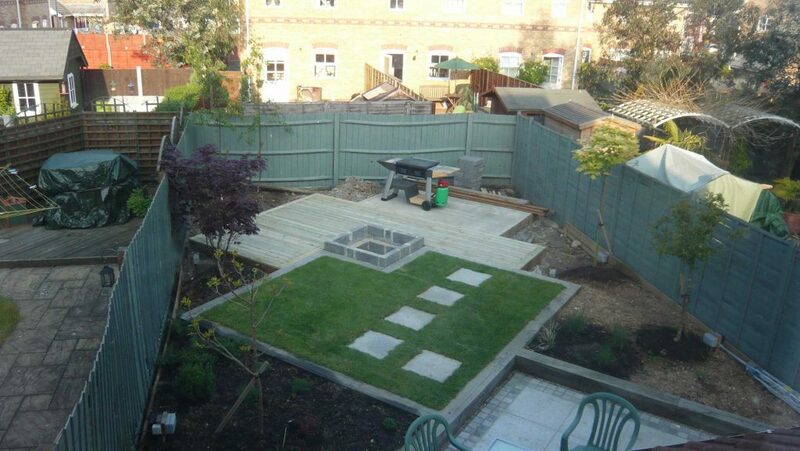 We landscapers are quite adept and handling timber. In fact it’s not unusual for trained carpenters to leave the construction industry and join landscaping teams (simply because landscaping is more interesting than nailing skirting boards to walls). So to make a deck to fit precise contours in the garden, perhaps with steps and integral lighting, is relatively simple if you know what you’re doing. Timber has beautiful natural features, depending on which type of wood you choose, you can have stunning grain lines and colour variations. And then of course you can tailor the wood preservative to get an even more spectacular finish. The Ground Force Team I’m told were fans of painting things blue. Personally I prefer a more natural looking finish that really pays homage to the trees that were used to create the decking boards. 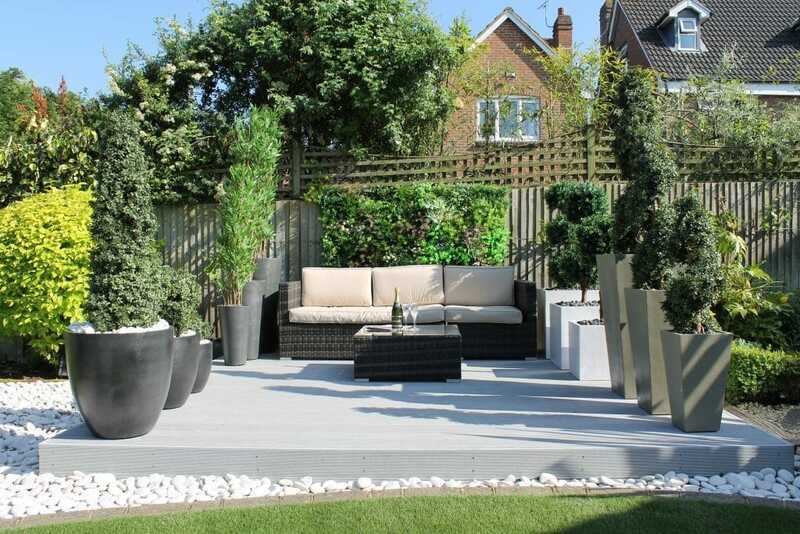 From a garden design perspective, Decking has a number of uses. It supplies texture, colour and can be used to contrast with other ground cover materials such as paving or grass. Because the boards are long and slim they can influence the way the garden is used. You could use decking to make a path or a board walk, an outdoor dining area or a pond surround. What’s really clever, and my colleague Katie at Tapestry Design Studio is a master of this – is you can use decking to change the perceived proportions of a garden. 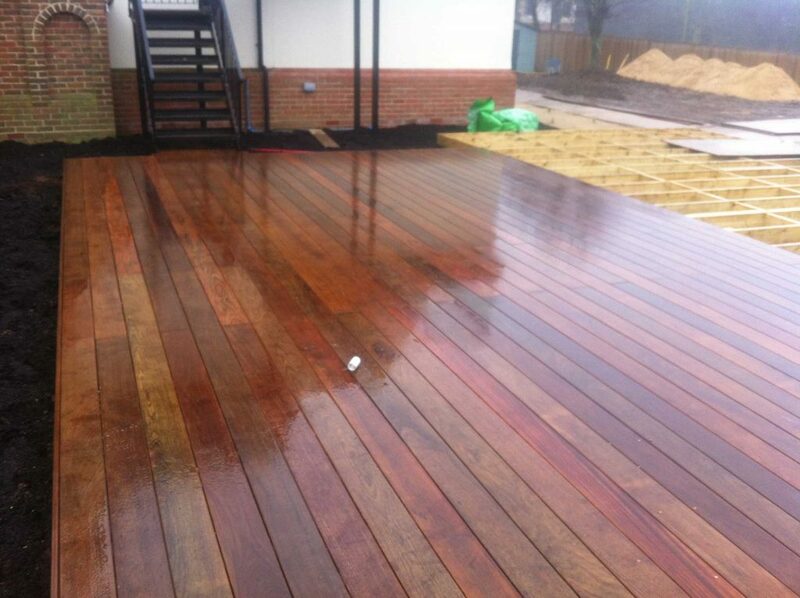 Decking boards that go away from you lead the eye towards a feature and make a garden look longer and slimmer. They make you want to follow them and walk out into the garden. When decking boards run widthways they make an area appear shorter and are almost like a barrier. They encourage you to stay put, sit down, rest a while and take in the view. Decking boards that run diagonally are awesome – they completely change the way you use a garden. You feel compelled to move from side to side, exploring every little piece. At the same time a diagonally laid deck makes the garden seem longer AND wider. That’s why landscape gardeners love decking! This garden was still a work in progress when this picture was taken. I think it’s a good example of how the angle of decking boards can change the percieved proportions of a garden. Natural timber is available from several different species of tree. I love native British Timber but some landscapers will tell you that the crème de la crème of decking timber these days has to be Southern Yellow Pine. It’s really tough and durable and can be used in other ways around the garden. 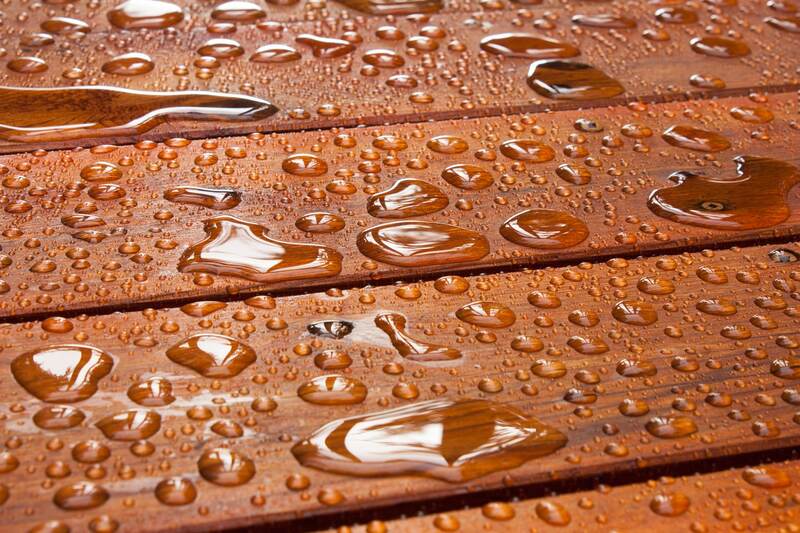 Most natural timber decking will need some maintenance during its lifetime. Depending on the finish, it might need a coat of oil or preservative from time to time just to keep everything ship-shape and strong. 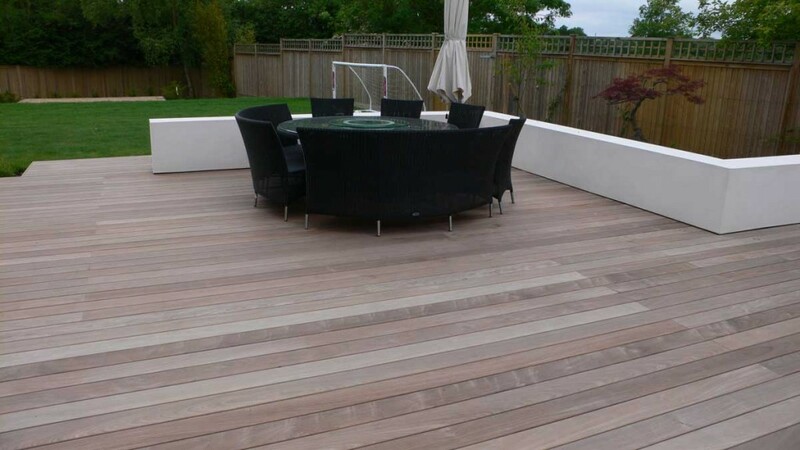 Composite Decking is a modern landscaping material. It’s a mix of wood fibre and plastic which means that it won’t need preservative and, provided you use one that is UV stable, the colour won’t fade either. It’s available in some lovely natural-looking finishes, is said to be slip-proof, low maintenance and long-lived. Which type of decking would I recommend? Well it all depends on the client, the garden designer and what they want to achieve with it. For most projects natural timber would be my first choice. But then I’m a gardener at heart and I prefer working with nature has provided. And now, for your delight and entertainment – here’s an Episode of Ground Force….the TV program that raised the profile of decking. Why ask a professional landscaper to build your decking?